April 2007 Online Slots News. April 28, 2007. Leading Online Gaming Site River Belle Offers Multi-Player Viper Platform And Slots Tournaments. River Belle Online Casino, one of the leading online gaming destinations, is hosting online slots tournaments beginning April 25. The unique design and advanced site functionality ensure a highly user-friendly interface, guaranteed to offer online players an exciting and fast-paced online tournament environment. The slots..
April 27, 2007. Pub Fruity And Life's a Beach Slots From Microgaming In May. April 25, 2007. Take Part In 'The Great Escape Promotion' At Fortune Lounge Casinos. 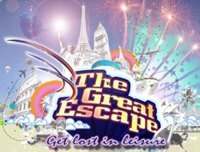 The Great Escape is the latest exciting promotion that will be running for the next 8 weeks at Fortune Lounge online casinos. The promotion will culminate with 60 finalists taking part in the Grand Finale LIVE Tournament, where everyone will win a prize. Players will be invited to take part in weekly promotions with weekly qualifier tournaments securing their seat in the final event. The top 3 winners will get to choose their prize from 4 awesome getaway options, plus there are over 100,000 credits to be won. This is definitely a unique promotion for regular slots players as you may win some extra prizes playing your favourite games. April 6, 2007. Easter Weekend - Bunny Bonuses At Slotland Casino. Easter has it's Easter Bunny and Slotland casino staff asked the Easter Bunny to hop over to Slotland on this special weekend to bring special Bunny Bonuses to all of the online casino players. Easter Weekend Bonuses Get 20% bonus from Slotland Casino of each deposit made during Easter Weekend on Saturday & Sunday, April 7 &..
April 2, 2007. Jackpotjoy Releases Brand New Slot Machine Game Strike It Lucky Yesterday. The new video slot has been released on Friday, Mar 30 2007. This dynamic addition is based around the UK TV classic quiz show - this latest release is sure to grab the attention of online casino players. It's a 5-reel, 20-line video slot, featuring an incredible bonus game and of course the signature of Jackpotjoy - a..